Welcome to Day 4 of our A Very Toddler Easter series that we are co-hosting with Kristina from Toddler Approved. 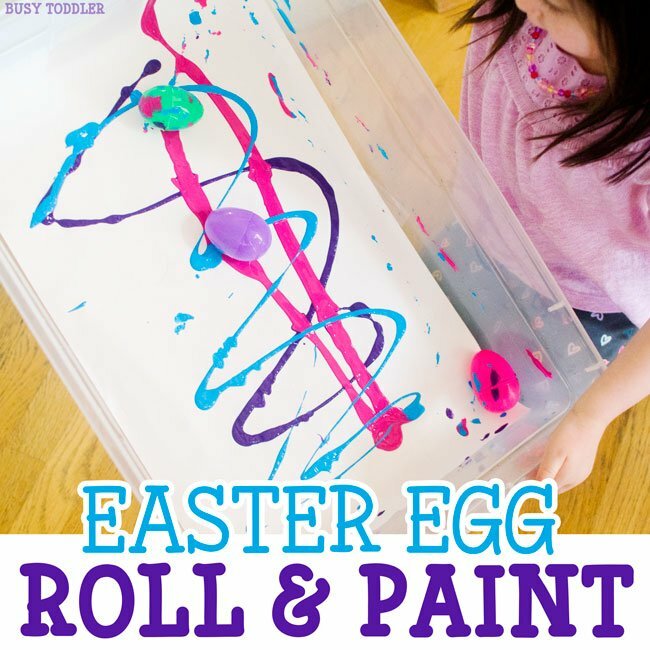 Each day this week, we are sharing a new Easter activity idea for toddlers. Check out our Easter page for all the Easter activities! 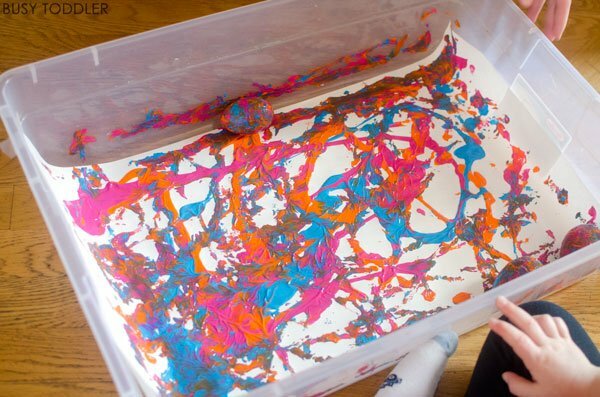 Who doesn’t love a toddler art project? They are literally the most adorable art work that you can put on your fridge and nothing makes a toddler happier than being a featured artist. 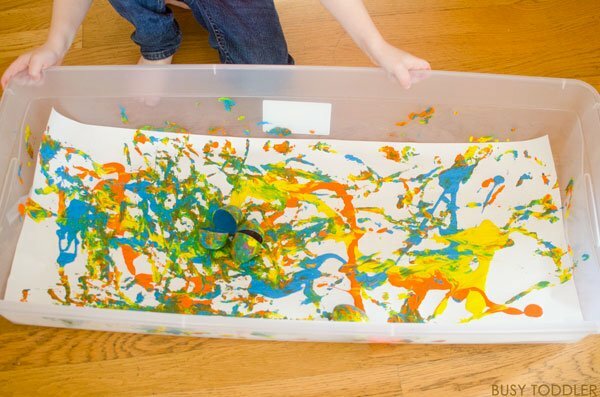 That’s why I try to do a simple “fridge worthy” art project with my toddlers each month. Something simple, easy, and fun that we can showcase. 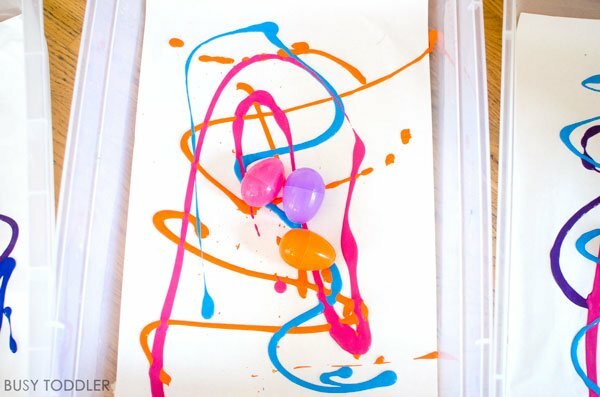 This Easter Art Activity was perfect for my kids! 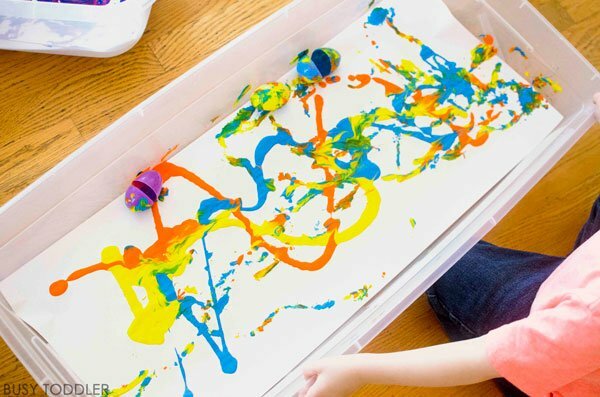 I was so inspired when I saw this activity idea on Fun at Home With Kids – I knew I had to give it a Busy Toddler spin. We made painting with Easter eggs into a group activity and invited over some of our best kid friends, and got out every storage tub I own to do it. It made for a lot of laughing, a lot of giggles and some very fridge-worthy art! I did this activity with my 27 month old and my 3.5 year old, and their friends. Nothing like a simple art set up! Do you see how many storage tubs I own? 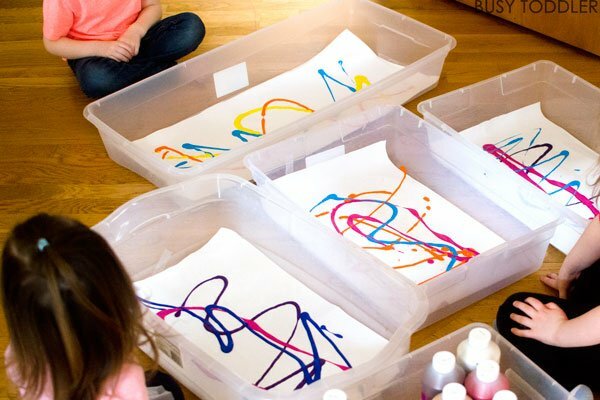 In my defense, they are so perfect for sensory bins and if I didn’t have this many, we couldn’t do fun friendship art activities like this. The kids loved this project – and who wouldn’t?! 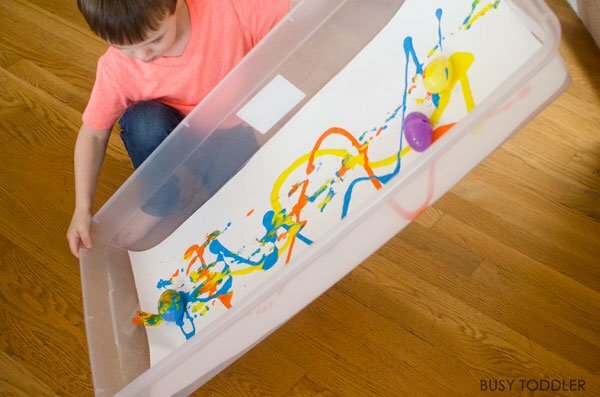 I taped down some butcher paper in the bottom of each kid’s storage tub – then added the colors of their choice. We (aka my Mom friends and I) decided 3 colors would be perfect and would be most likely to still look nice at the end (not like rolled around brown paint – wink). I dropped in 3 Easter Eggs for each kid and let the rock and roll painting begin. This was such an arm workout! I’m not kidding when I say that it was a workout to move these bins. The kids loved shaking the bins back and forth trying to get their eggs good and covered. 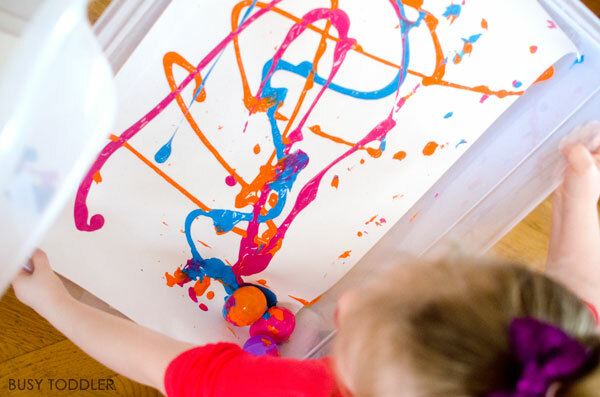 The messier the egg the better – we wanted those canvases filled with paint! Wait for it…the end result! We left these to dry overnight – it was a lot of paint that needed to dry! 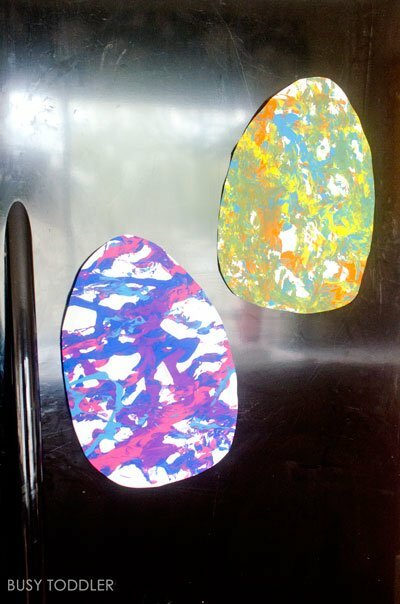 Once the art was good and dry, I cut out an egg shaped section that’s been fridge-perfect for Easter season. These canvases were big enough that I even cut out extras to send to the Grandparents. Talk about a one-shot art project. 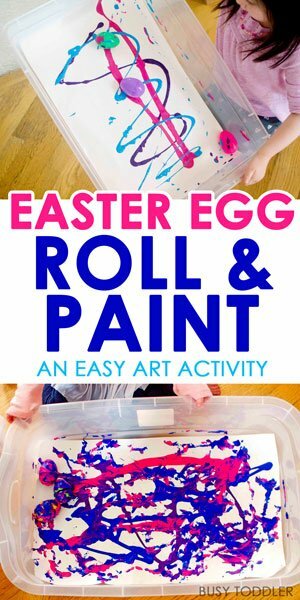 This Easter Art activity was the perfect art for Easter-time. The eggs came clean with a little soapy water, the toddlers stayed reasonably clean (despite shaking around boxes of paint covered eggs) and the final product is oh-so-cute. What’s your favorite Easter Art Activity?